Abstract. The development of polymeric materials offers new perspectives of science and technology due to their outstanding properties. These properties are obtained either due to the effect of dispersion polymers and their polymerization either due to their intervention in structure formation. They were prepared epoxy resin polymer concrete, Portland cement, coarse and fine aggregate and to evaluate the influence of resin dosage on microstructures and density of such structures reinforced concrete mixtures. The paper detailing the raw materials used in experimental works and structural properties of concrete studied. Abstract. To know more precise the value of overall heat transfer coefficient is on a special importance to programs (software) that models the solidification process for project casting technology in order to optimize them by dimensioning and appropriate placement both the gating system and the risers for eliminate casting defects, shrinkages. The paper aims to determin the value of overall heat transfer coefficient on the cooling curve recorded in casting-solidification real conditions. The values obtained for the overall heat transfer coefficient (2.34 to 25.41) · 10-4 [cal/s.grad.cm2]) for different casting conditions prove that this parameter can not be considered as a constant of the casting mould material. Abstract. This article presents different solutions to reduce natural gas consumptions of the aluminum melting furnaces, through recovery of the heat from flue gases. In order to be able to analyze the recovery solutions, a mathematical model for energy balance of these furnaces was adapted. This mathematical model allows drawing up energy balances together with the main working technique and economical parameters of these types of furnaces, in actual conditions, and the same, under optimizing conditions, by applying recovery solutions. The mathematical model which can elaborate energy balances for aluminum melting furnaces, was transposed in M. EXCEL based software, where the quantification of different solutions for natural gas consumption saving is possible.One of the applications of this computer software for an aluminum melting furnace, either for actual working conditions or per upgraded furnace by use an air pre-heater, materials pre-heater, or a regenerative burner system, is presented in this article. Abstract. The article presents a comparative analysis on the hydration of cement paste without superplasticizer and water/cement ratio of 0.35 and a cement paste with the same water /cement ratio but has in its composition 2% superplasticizer additive Glenium Sky 526. For characterizing the hydration process of cement paste, both mixtures were subjected to X-ray diffraction and thermogravimetry analysis, at 3, 7, and 28 days passed since the initiation of hydration process. Abstract. This paper presents solutions and the equipment for preheating combustion air from scrap aluminum melting furnaces through flue gas heat recovery . For sizing convection pre-heaters , there has been developed a mathematical model which has been transcribed into a computer program in C + + . A constructive version of the pre-heater was drawn up and a recovery heat exchanger was manufactured and mounted on an aluminum melting furnace. Both the functional parameters values and the reasons causing the pre-heater worning out, as well as the steps taken for sizing and the achievement of a new air pre-heater able to bear the operating conditions of the aluminum melting furnace are shown. Abstract: Following the sliding motion between two surfaces a heat release occures which leads to a changing of the mechanical properties of the surfaces in contact. Amongst the factors that influence the heat release one may name the loading, the velocity, the surface topography, the surface material, the lubrication and last but not the least, the environment. The present paper proposes a computation model to determine the temperature in the working of a coupling to which the mechanical characteristics of the materials are not affected by changes which, at their turn, lead to undesired effects. Abstract. The paper presents an original concept for interfacing tactile force sensors in modern cyber-mechatronic systems. The authors show the results and conclusions of a PSPICE simulation of an original patented circuit. In the simulations, in models used were introduced some circuit components corresponding to the physical implementation for a practical mechatronic system which has already been used for the analysis of human walking. After these simulations were revealed important aspects of dynamic behavior and was proposed an optimal variant of the interface circuit as a non-typically instrumentation differential circuit spitted in two parts, one near to the sensor, and the second far from the sensor and close to an A/D converter of the data acquisition system. For electrical links between the two parts can be used low cost cable without important loss of the signal / noise ratio. Abstract. The current scientific work shows for the first time a new complex mixmechatronic concept of integration and fusion in the structures of smart technical and technological systems and of the systems of electronic control for holistic physical-virtual assembly. 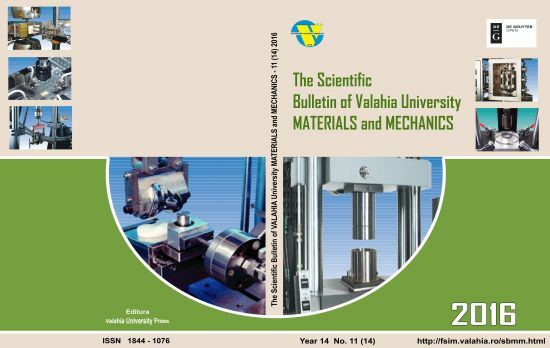 In the content of the paper highlight some results of professional research in Mechatronics and Cyber-Mix Mechatronics the National Institute of Research and Development in Mechatronics and Measurement Technique– Bucharest and universities PUB and in Romania, some of which are in the process of transfer and capitalization to the industry, economy and society. Abstract. In the engineering practice, knowing the technical condition of industrial equipment under operating results shortening of repairs, repairs machinery to smart planning based on the time evolution of bearing wear, detect and correct errors on their installation or repair. This is one of the most important objectives of proactive maintenance; maintenance engineer must follow and monitor the wear of equipment with moving parts to prevent damage and removing them permanently from service, ensuring repair costs as low as possible. The aim of this paper is to present a particular case study on vibro acoustic diagnosis of equipment and components subject to wear during operation to prevent catastrophic damage, as well as human and material losses. Abstract: The main objectives of the present project are to study and to improve mechanical properties of different systems from mechatronic and biomedical domains, in order to increase their functionality and life span. This is why nanostructured thin films (e.g. Al, Cr, Ti, Ti/Al multilayers) were deposited on different steel substrates, used in mechatronic and biomedical applications. By the characterization of coated surfaces of the products used in various fields such as medicine, mechatronics, electronics, etc. depends their proper operation, durability and reliability. This is the main reason why, we studied new types of layers and multilayers using Atomic Force Microscopy and scratch tests. The main result of the realized tests is that all studied nanostructured thin films offer the possibility of increasing the lifetime of substrates, being an important factor for proper functional operation, durability and reliability of the final systems in which they are used.